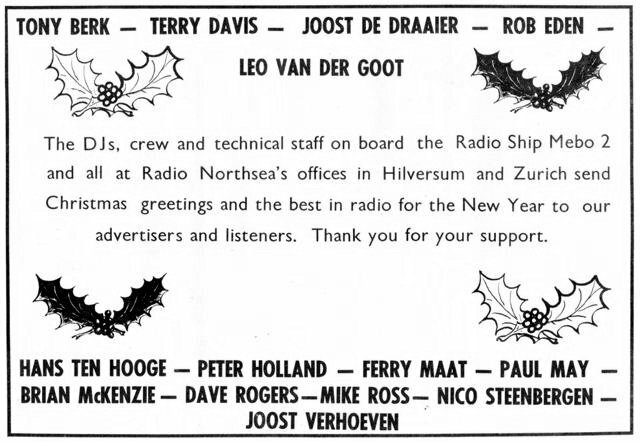 Following the seizure of the two Caroline ships in March 1968, a few Christmases passed without any English-language offshore radio in Europe. Radio Northsea International was launched in 1970 but closed again a few months later, not lasting through to Christmas that year. In early 1971 though it returned to the air and by Christmas was well established with Dutch programmes during the day, English at night. Christmas greetings from Radio Northsea International. Advert from ‘Record Mirror’, issue dated 18th December 1971, courtesy of Munro Jack. Because of the one hour time difference between the UK and Holland, the Dutch disc-jockeys on RNI celebrated New Year ahead of their British colleagues. During the autumn of 1972, Caroline's mv Mi Amigo put to sea again and began broadcasting off the Dutch coast. Output over the first few months was erratic and, for a while, the station was known as ‘Radio 199’ but it was called Radio Caroline again by Christmas. And, just a mile away, Radio Northsea International was on the air too. Andy Archer and Crispian St.John, on board the Caroline ship, had both previously worked on RNI so it was only natural that the two stations should link up to exchange the season's greetings. It sounds as if there may have been some alcohol invoved too! Robb Eden and A.J Beirens on RNI sharing a few in-jokes with Andy Archer and Crispian St.John on Caroline on Christmas Day. Recording from the Offshore Multimedia CD-ROM (duration 2 minutes 37 seconds). New Years Eve on RNI as Don Allen and Arnold Layne say hello to some former colleagues. Don keeps accidentally referring to Arnold as “Roger”, the name he used when the two of them had previously worked together. Recording from the Golden Radio NL archive shared on the Internet Radiocafé, now known as the Radiotrefpunt (radio meeting point) forum by MartinJA. Our thanks to him (duration 6 minutes 52 seconds). Offshore radio was about to undergo another boom time at the end of 1973. As well as the well-established Radios Veronica and Northsea International, on the Mi Amigo test transmissions were going out for the launch of a new Belgian station, Radio Mi Amigo, shortly to be joined by the English-language programmes of Radio Seagull; and on the mv Jeanine, low powered test broadcasts were running for the launch of another Belgian-owned station, Radio Atlantis. There was to be no link-up between RNI and Caroline at Christmas 1973 - the RNI bosses had forbidden it after the previous year's frivolities - but there was still plenty of fun on both ships. Crispian St.John, on the air at midnight UK time, wishes everyone, including political leaders and the British royal family - all, no doubt, regular listeners - a happy new year! Recording courtesy of The Offshore Radio Archive (duration 3 minutes 33 seconds). In August 1974 the Dutch anti-pirate legislation forced the closure of Radios Veronica, Atlantis and Northsea. However the two stations based on the mv Mi Amigo continued, Radio Mi Amigo by day, Radio Caroline at night - northern Europe's last remaining pirates. Tony Allan and some of the crew with their New Year messages at 11pm GMT, 12 midnight Central European Time, on 31st December 1974. Recording kindly provided by Hans Knot (duration 5 minutes 44 seconds). The latter part of 1975 was not a good time for Caroline. In November their ship, the mv Mi Amigo, lost her anchor in a gale and drifted inside the UK territorial limit. After a bungled towing attempt, the station returned to the air while still inside British waters, resulting in a police raid and the arrest of four people. After a couple of weeks silence, the station returned from outside the limit on 26th November but it was a relatively subdued festive season, with just two DJs on board, Geoff Bolan and James Ross. 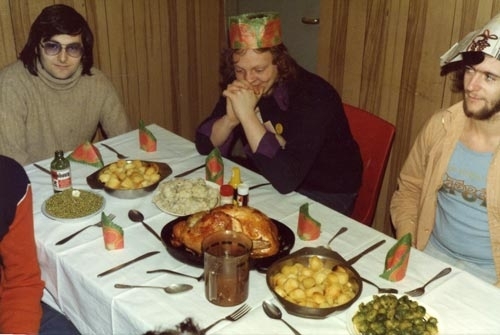 Christmas dinner on the Mi Amigo, 1976. Left to right Steve Kent(? ), Mark Lawrence and Tom Anderson. Photo kindly provided by Hans Knot. For some years in the early seventies Radio Caroline only broadcast a night-time service but, from May 1976, the station was able to provide 24 hours a day English-language programmes again. Over that Christmas and New Year period Mark Lawrence, Tom Anderson, Ed Foster and Steve Kent presented a number of festive shows including an All-Time Top 100, produced in conjunction with Wavelength magazine, individual DJs counting down their own Top 30 favourite tracks, an album review of the year and some music specials. During November 1977 severe storms hit the North Sea and both Radio Caroline and Radio Mi Amigo were silenced for a time. Although the anchor chain held, the appalling weather prevented a tender reaching the ship and the DJs were forced to endure dreadful conditions and little food. Eventually the weather subsided and the stations returned to the air on 22nd November. However at the beginning of December Radio Caroline reverted to night-time broadcasting only with Radio Mi Amigo filling the daytime hours. At Christmas Roger Mathews and Stuart Russell were three quarters of the way through a massive four month stay on board and had been joined by Brian Martin. Radio Caroline was off the air from 20th October 1978 until Easter Sunday 1979 so there were no Christmas broadcasts in 1978. When the station returned to the air in 1979 it had a Dutch service by day, English at night. 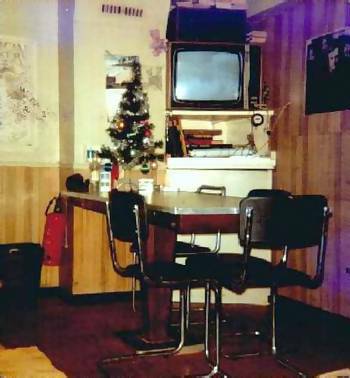 The mess room on the Mi Amigo at Christmas 1979. Photo kindly provided by Johnny Lewis's Rounds And Sounds website. Christmas in the Eighties over the page. Back to Christmas in the Sixties.